Taipei, Taiwan, January 21, 2016 – QNAP, Inc. today announced that the QTS & Android dual-system TAS-168/268 NAS now supports Netflix. The QNAP TAS-168/268 is the first Android-based NAS that supports Netflix, and users can download the free Netflix app from Google Play on Android. Simply connect a QNAP TAS-168/268 to an HDMI display to enjoy the numerous programs and multimedia content on Netflix with a smooth and convenient streaming experience. Powered by an ARM v7 dual-core processor with 2 GB DDR3 RAM, the QNAP TAS-168/268 is designed as a compact media NAS optimized for home use. 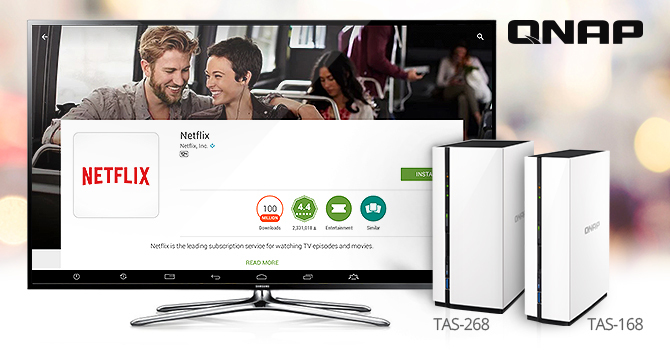 Certificated by Google, users can download Netflix and many other multimedia apps from Google Play on TAS-168/268. Coupled with terabytes of storage capacity and 4K (H.265 & H.264) HDMI output, the TAS-168/268 is the optimal budget-friendly multimedia NAS that provides near-unlimited entertainment possibilities for modern digital lifestyles. The free Netflix app for Android devices is available from Google Play, and users can download it from Android Station on their QNAP TAS-168/268.